Myrmica sabuleti forms mature colonies of about one thousand workers and a few queens. Although living in dry and sunny biotopes, this species avoids foraging during the warmer hours of the day which correspond to the period of the maximum foraging activity of two sympatric species, Formica fusca and F. cunicularia. M. sabuleti is the most frequently observed species on the extrafloral nectaries of Vicia sativa, even during the warmer hours of the day, whereas F. fusca is the most frequent species during those hours at tubes of 1M sucrose solutions placed on the ground. In spite of this temporal segregation, the foraging activity of M. sabuleti and F. fusca overlaps two times a day (10:00‐11:00 am and 5:00‐8:00 pm). Newly discovered large food sources are exploited by M. sabuleti through an explosively increasing recruitment, whereas workers of F. fusca forage mainly individually. 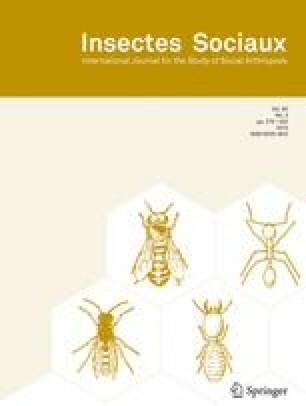 Interference between M. sabuleti and F. fusca was studied when offering sucrose solutions, large dead insects unretrievable by individual foragers of either species (cockroaches), medium-sized insects retrievable by single foragers of F. fusca but not by single M. sabuleti(larvae of Calliphora erythrocephala) and small insects (Drosophila) retrievable by individual foragers of both species. Owing to its rapid recruitment, M. sabuleti is able to displace F. fusca from sucrose solution and large dead prey during the overlaping of the activity cycles of both species. When medium-sized corpses are offered, the issue depends on the speed of the events. F. fusca is able to take the prey away only if it discovers it before M. sabuleti has recruited nestmates. Small dead prey do not lead to interference, but is taken by the first worker that finds it. Key words: Ants, foraging, interspecific competition, Myrmica sabuleti, Formica fusca. Received 15 December 1995; revised 20 November 1996; accepted 28 November 1996.